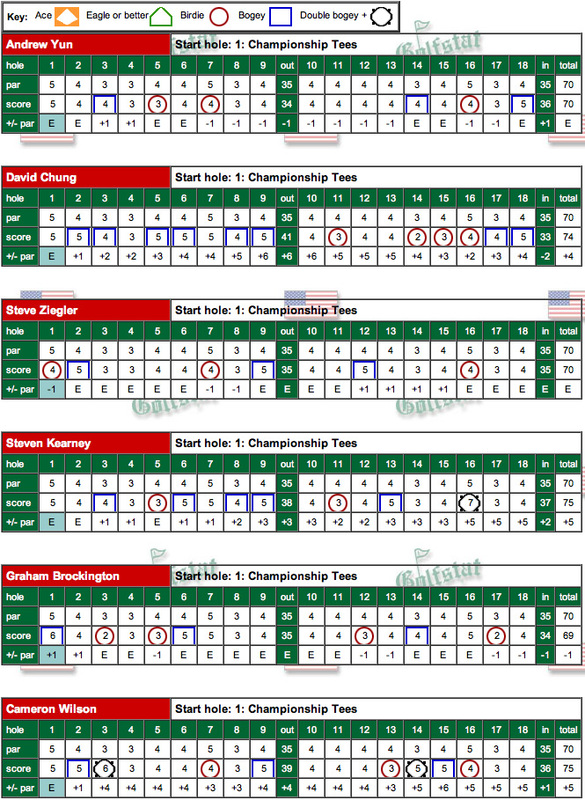 Stanford lineup for the 52nd Pac 10 Championship being held at Stanford historic golf course includes Andrew Yun, David Chung, Steve Ziegler, Graham Brockington, Steven Kearney and Cameron Wilson - these 6 players are competing with 5 scores counting each of the 4 rounds. Results are posted below in reverse order below with the tournament background posted after each of the four round results. FINAL RESULTS - On a beautiful spring day Stanford fought hard but came up just short of a win on its home course, ending 5 shots behind USC and Oregon and two shots behind UCLA. 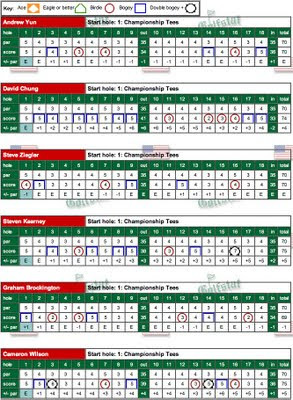 David Chung finished with a 1-under 69, despite two closing bogies, in a closing round that bodes well for Stanford's NCAA prospects as David in regular form is a force to contend with. Andrew Yun finished 4th individually (72-70-66-70) closing with a 70 in a round where he couldn't get putts to fall. With the tournament decided, he made one of his few bad swings on the 18th tee to finish with a double bogey. It's been a spectacular year for Andrew, however, one that will certainly earn him All-American honors as Stanford's leading player. He has a remarkable seven top 5 finishes in the ten tournaments this season. I was most impressed by Andrew's course demeanor in his final round, displaying poise and positive body language - and he couldn't have been a better gentleman to his playing partner, freshman Martin Trainer of Palo Alto and USC, who won individual honors in the event. 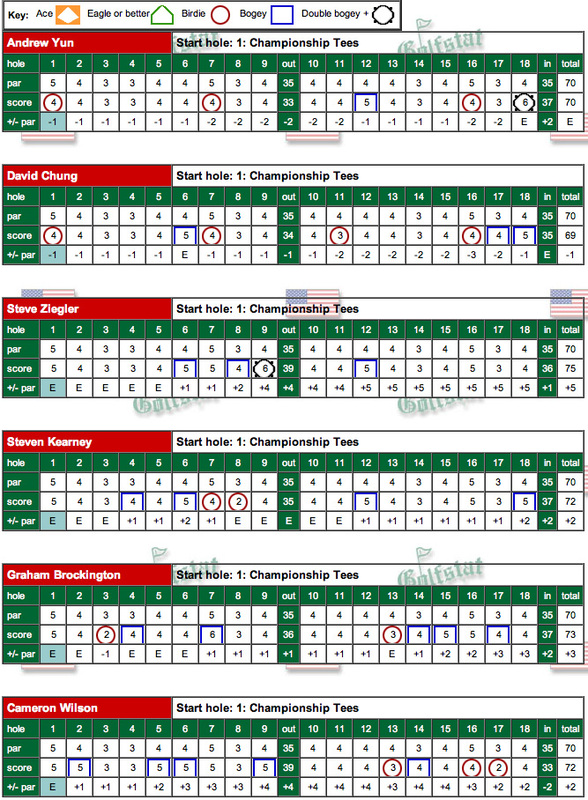 Senior captain Steve Ziegler tied for 11th individually (69-70-70-75) after a 4-over four hole stretch of holes from 6 thru 9 led to a front nine 39 -- he followed with a 36 on the back in a round that may have been affected by Steve's limited play and conditioning recently due to a bad back coming into the tournament. It was good to see Steve strongly supporting his teammates' good play in front and behind him during the event. Senior Graham Brockington had his finest hour in his Stanford career finishing tied for 16th overall (70-69-73-73). After limited appearances in his first three season, this final season has found Graham steadily improving to play his best golf in recent weeks. In this event, only some struggles at the end of his final two founds kept him from contending with the leaders. Steven Kearney, an improving sophomore, contributed three solid rounds to the team's efforts (71-75-72-72) to finish tied for 30th individually. 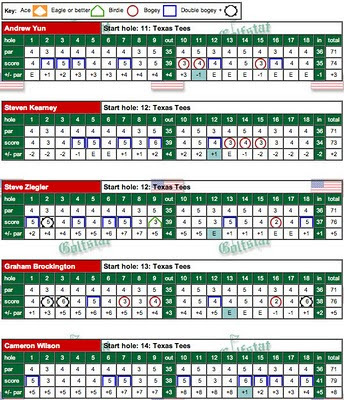 Steven showed a big-time, long-hitting game that was so close to top form only lacking a few putts to fall here and there. His performance bodes well for Stanford's future. 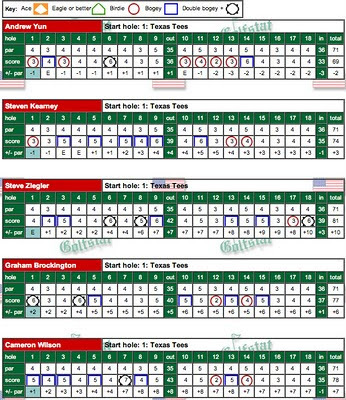 Freshman Cameron Wilson started slowly in his final round as he went out in 4-over 39 without a birdie, but came through big-time on the back nine with a 33 including clutch birdies on 13, 16 & 17. No doubt a bright future is ahead for Cameron who has a balanced, fluid swing and great length. The NCAA championships lie ahead for the Cardinal and the team is poised to do great things. STANFORD, Calif. - Playoffs decided both the team and individual titles at the 2011 Pac-10 Men's Golf Championships at Stanford Golf Course as USC defeated Oregon on the first playoff hole to claim the team championship, while USC's Matt Trainer defeated Alex Moore of Oregon State on the seventh playoff hole to win the individual title. Stanford shot a final round team score of 356 (+6) on Sunday to finish fourth . Alex Kim of UCLA finished third at 277 (-3) while Stanford's Andrew Yun placed fourth at 278 (-2). Oregon, which began the day tied with UCLA for third place at +20, shot a final round team score of 345 (-5) to force a playoff with USC, which carded a final round 354 (+4). Daniel Miernicki (67; -3), Jack Dukeminier (67; -3) and Andrew Vijaro (69; -1) led Oregon's final round charge, combining to shoot -8 on the back nine. Vijaro was -4 on the back side alone, collecting an eagle on the par-4 15th hole. Sam Smith was the only Trojan in red numbers on Sunday, managing a three-under 67, while Trainer shot an even par 70, which included an untimely bogey on the par-5, 16th hole. 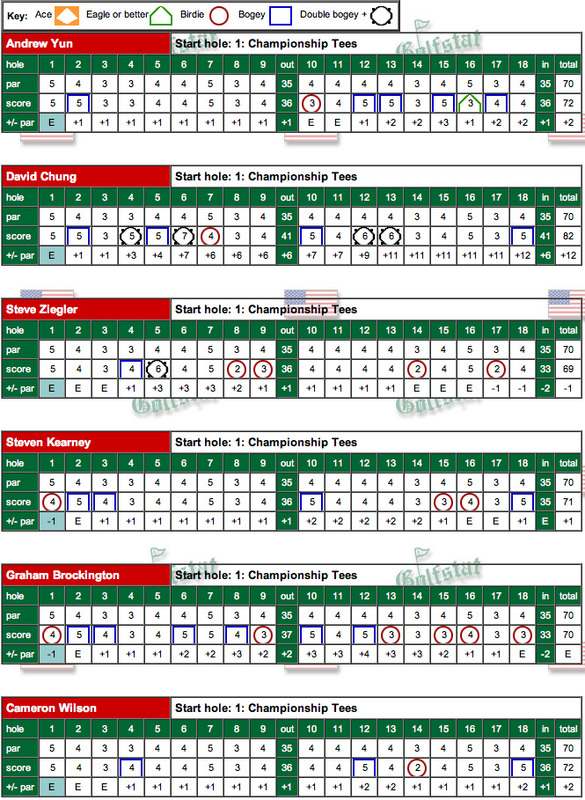 All told, USC played the back nine at four over par, to slip into a playoff with the Ducks. After Trainer claimed the individual title in a seven-hole playoff that took 1:45, USC won the six-player, one hole playoff in convincing fashion to earn the team title. Trainer, a product of Palo Alto's Gunn High School, pared the seventh playoff hole to claim the individual title over Moore. After the two players matched pars six times on the 18th hole, Moore drove into the right rough and was forced to chip out. His third shot landed 25 feet right of the hole and his attempt to save par came up inches short. After hitting a perfect drive, Trainer's second shot to a back pin location came up some 40 feet short, but the sophomore was able to salvage par to claim the conference's individual title. Stanford entered the final round in second place at +14, three strokes behind USC. However, the Cardinal was +6 on its final round, with only one player managing to come in under par. 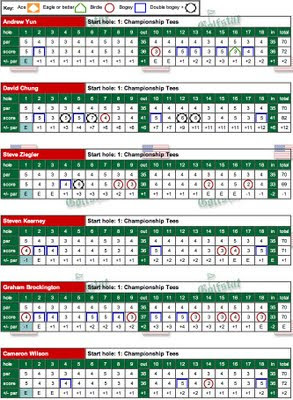 Yun, who was paired with USC's Trainer on Sunday, was -2 on his round before making a double bogey on the par-4, 18th hole to finish at even par 70. It marked his seventh top-5 finish in 10 events this season. Senior Steve Ziegler tied for 11th at 285 (+5), shooting a final round 75 that included three bogeys, one double bogey and no birdies. Graham Brockington tied for 16th at 285 (+5) after a final round 73. He was even par on his round through 13 holes but bogeyed three of the last five holes to finish three over for the day. 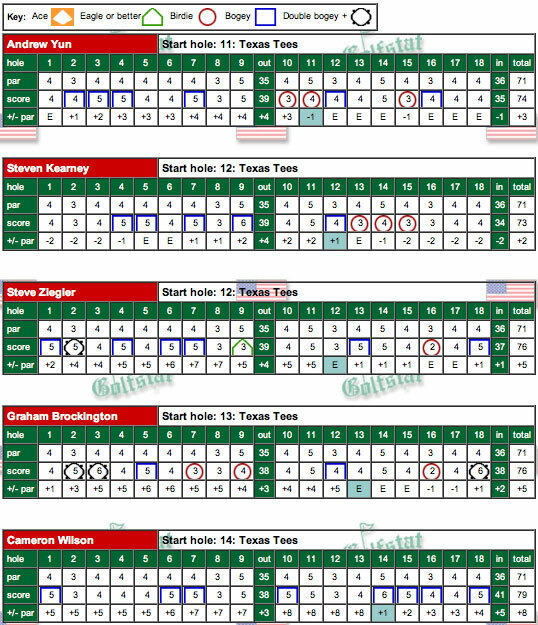 Steve Kearney tied for 30th at 290 (+10) after carding a final round 72 on Sunday. He was even par through his first nine holes but picked up bogeys on holes No. 12 and 18. Freshman Cameron Wilson tied for 42nd at 295 (+15), closing with a final round 72. After playing his first nine holes at +4, Wilson picked up three birdies on the back nine to finish with a 72. Junior David Chung finished 44th at 296 (+16) after shooting a final round 69, the only Cardinal under par on Sunday. Chung was -3 on his round before making bogeys on his final two holes of the day. He played his last 45 holes of the tournament at two under par. Stanford will wait to hear on its draw for NCAA Regional play, which gets underway on May 19 at a site to be determined. ROUND THREE - Stanford has climbed up the leader board into 2nd place after three rounds, 3 shots behind USC. Three Cardinal golfers have moved into the top 10 individually led by Andrew Yun who is tied for 3rd at 2-under, 208 total (72-70-66), after a solid 66 in round three that included 5 birdies and only 1 bogey. 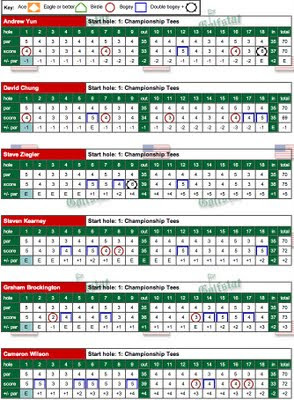 Steve Ziegler continued his consistent play with an even par 70 that included two birdies and two bogeys and is tied for 5th overall with rounds of 69-70-70. Graham Brockington is at 212 total (70-69-73) tying for 9th overall despite a closing bogey-double bogey finish. Stanford article with photo gallery. The photo at the left of Andrew Yun is courtesy of Dave Elkinson. ROUND TWO - The 2nd round was played on day 1 again under tough, windy conditions. It's a wide open tournament with two rounds left to play. Stanford remains in 3rd place three shots behind USC and one behind Oregon with UCLA a shot behind Stanford in 4th. Seniors Brockington and Ziegler again led the way with 69 & 70 respectively and are tied for 4th individually at 1 under 139 totals. Sophomore Andrew Yun had a solid even par 70 and is tied for 14th individually at 142. Playing on a cool, sunny and very windy day Stanford finished round 1 in 3rd place 3 shots behind Oregon and 1 shot behind UCLA. It was a struggle early as Oregon shot out to a large lead over the front nine and Stanford came on strongly to close the gap. Two seniors led the way, with both struggling early and coming on fast with very strong finishes. 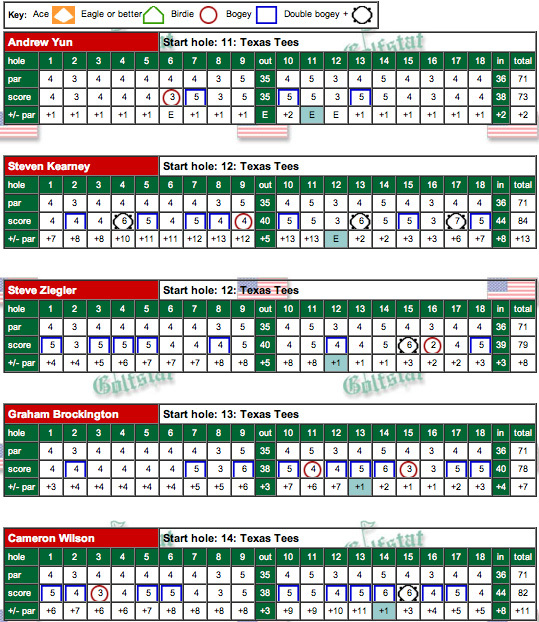 Steve Ziegler 1-under 69 had him 3 over par after 5 holes and finishing with four birdies and no bogies thereafter. Graham Brockington also finished strong with four birdies starting on 13 after going 4 over through 12 holes. 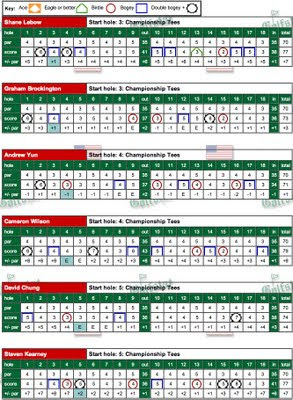 Sophomore Steven Kearney played steadily throughout with nines of 36-35 on his way to a solid 1-over 71 while Andrew Yun and Cameron Wilson carded 2 over 72 scores. 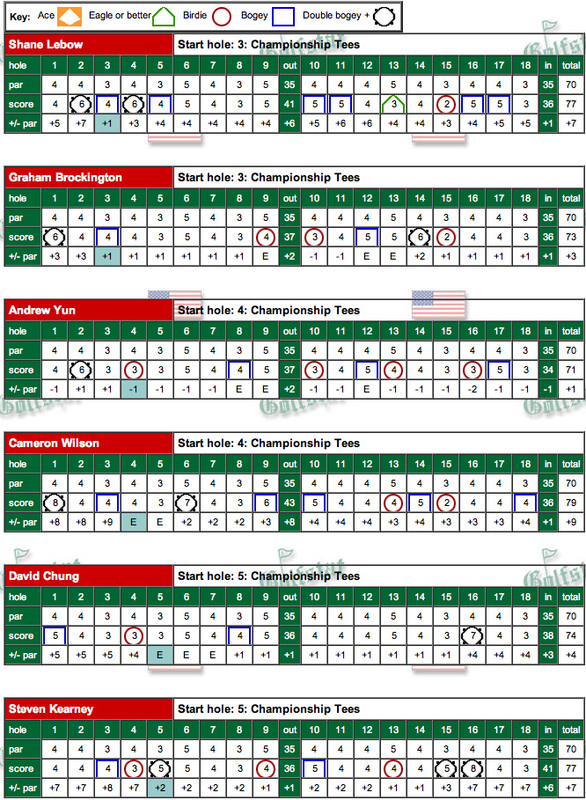 David Chung struggled to an 82 marred by a triple and two double bogies. Round one scorecards are below - click to enlarge. No included in the lineup was senior Sihwan Kim, again due to concerns of aggravating his back. Coach Phil Rowe shares that "the obvious omission is Sihwan. In the end it was a decision that was taken to eliminate any risk that sihwan might aggravate his back on a long 36 hole day. NCAA regionals and nationals are 1 round per day and we want to be absolutely sure that he is able to come through the entire post season." Here are some useful links for the tournament: Tee times & Pairings | Stanfordmensgolf.org | Official Pac 10 site | Real Time Scoring | Stanford Golf Course website | gostanford.com announcement. UCLA is the team to beat based on the national rankings by Golf Week shown below. In those same rankings, sophomore Andrew Yun is the ranked 2nd nationally just ahead of UCLA freshman Cantlay. Stanford is looking for strong support from past All-Americans David Chung and Steve Ziegler who have shown signs of returning to form that had each all Pac 10 performers. "The fact that we are playing on our home course lends itself to having six guys playing with the mentality that they can win the golf tournament," he said. "With the six, count five format, you really need to rely on the depth of your team. I've felt good about our depth one through 10 all season. We'd all like to see Andrew continue his excellent form this weekend," said Ray. "He's established himself as one of the premier players in the country." The Cardinal is also counting heavily on Chung, who played in the Masters earlier this month as the U.S. Amateur runner-up, but has just one top-10 finish this season. "David is eager to get out there," said Ray. "He's worked through some scheduling challenges that comes with playing in the Masters and is feeling really good about his game right now." Ziegler and Brockington both have Pac-10 Championship experience, while Kearney and Wilson will be making their conference debuts. "We definitely need production across the board, especially since we are playing six guys," said Ray. "In our strong tournaments this season, we've had multiple guys in the hunt. On the other side, we've had our tournaments where only one or two guys play well and the rest of the team struggles." While ending a 16-year title drought remains the ultimate goal, Ray has also stressed to his team the importance of building up some momentum with NCAA Regional play rapidly approaching. "To be able to call yourself the champion of the Pac-10 Conference is a great accomplishment and motivation in of itself," said Ray. "But we also realize what is ahead of us. This weekend would be a great time to start building some momentum." An exciting development for the Stanford Cardinal is that two seniors and former All-Americans Sihwan Kim and Steve Ziegler may be healthy enough to return to the team lineup. Sihwan has had the more serious back issues that have produced irregular participation in team qualifying tournaments and prevented his travel for multiple events this season. Sihwan's best event of this 2010-11 season was a 6th place at the Gifford Collegiate at Cordevalle last November but otherwise. Team trainer Tomoo Yamada reports that “Sihwan strained his lower back and we have been slowly strengthening his back muscles to provide more stability to prevent from restraining the back as he retunes his game. We are carefully evaluating his returning date. As of April 22nd, his back is responding well and given what Sihwan has done in the past weeks, we expect to see him on the golf course soon”. Steve Ziegler tweaked his back before the last event at Pasatiempo and he missed his first event of the year. He reports his back is improving and although it has given him trouble in recent months he is hopeful that it will allow him to play at the important Pac 10 championship. Steve was a 2nd team All-American and member of the US Porter Cup team in 2009 and has been a key starter throughout his wonderful Stanford career. Coaches Ray and Rowe report that "we are excited that team captain Steve is likely to be able to play and that there is an outside chance that Sihwan may be able to tee it up for the Cardinal on the big stage of the Pac 10 Conference Championship. This is the time of year when there is great opportunity as the stakes get ramped up for the top ranked teams." Sihwan reportedly is almost at the point where he is healthy enough to hit his full range of shots and when that is combined with his phenomenal short game ability then his potential inclusion in the lineup is certainly an exciting development. 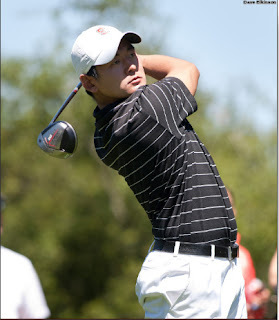 Sihwan was a first team All-American as a freshman after winning the US Junior Amateur championship at the Olympic Club. Congratulations to sophomore Andrew Yun, named to represent the United States in the Palmer Cup vs Europe to be played June 9-11 in Connecticutt. It's been a remarkably consistent season by Andrew in 2010-11 coming on the heels of very strong summer play. Andrew's 70.8 stroke average is low on the team by almost 3 strokes and he has 6 top 5 finishes and one 1st in 9 events. Andrew finished tied for 11th at Olympia Fields in September with rounds of 69-68-76 (213), first at The Prestige October 10-12 with 70-69-65 (204), 4th at Isleworth October 24-26 with 71-70-76 (217), 15th at CordeValle Nov 8-10 with 74-71-73, tied for 22nd in Hawaii Feb 2-4 with 75-68-69 (212), tied for 5th at USC Feb 28-Mar 1 with 70-70-71 (211), tied for 4th in Georgia March 27-29 with 71-68-72, finished 2nd in Texas with 73-74-69 (216) and tied for 2nd again at Pasatiempo Apr 16-17 with 68-70-71 (209). Here's a link to the press conference video announcing all selections on the Golf Week website. STANFORD, Calif. - Stanford sophomore Andrew Yun has been named to the United States teams that will compete in the 2011 Palmer Cup, which is set for June 9-11 at The Stanwich Club outside of Greenwich, Conn.
Yun will join Blayne Barber of Auburn, UCLA’s Patrick Cantlay, Abilene Christian’s Alex Carpenter, Russell Henley of Georgia, Oregon’s Daniel Miernicki, Bank Vongvanij of Florida and Washington’s Chris Williams on the U.S. squad. Henley and Miernicki were part of last year’s victories American squad at Royal Portrush with Henley posting a 3-1 record and Miernicki a 2-2 mark. The United States team will be lead by head coach Tim Poe of Central Missouri and assistant coach Michael Burcin of South Carolina. Representing Europe will be Arkansas’ Sebastian Cappelen, Ignacio Elvira of Texas A&M, Texas Tech’s Nils Floren, Jeff Karlsson of Kennesaw State, Liberty’s Robert Karlsson, Nick MacAndrew of Aberdeen, Augusta State’s Henrik Norlander and UCLA’s Pontus Widegren. Widegren went 3-1 at the 2010 Palmer Cup while Norlander was 2-2. Norlander also posted a 2-2 mark at the 2009 Palmer Cup at Cherry Hills and helped lead Europe to victory. Floren, Norlander, Widegren and both Jeff and Robert Karlsson hail from Sweden while Cappelen is a native of Denmark, Elvira is from Spain and MacAndrew is Scottish. Rickard Lindberg of the Swedish Golf Federation will serve as head coach of the European team and Northwestern’s David Inglis will serve as his assistant. Inglis is the first former Palmer Cup player to serve as a coach in the event after representing Scotland in both 2001 and 2003. The United States leads the Palmer Cup series 7-6-1. Stanford tied for 11th at the Western Intercollegiate played at the superb Pasatiempo CC designed by Alistair Mackenzie of Augusta National fame. Although relatively short in length at 6,615 yards, the par 70 offers many challenges to even the best players. Very fast, undulating greens provide a test of nerves and many holes require precise accuracy off the tee. This event included 6 players from each team with 5 scores counting each day -- two Stanford players paired up in each round with two others from different teams. MacKenzie himself lived on the 16th, one of the world's best and toughest short par fours, and Stanford's scoring showed that toughness. In the third alone, Steven Kearney's 4-over 8 and David Chung's 7 marred otherwise solid rounds. As he has all season long, sophomore All-American to be, Andrew Yun, was steady as a rock finishing tied for 2nd overall individually after rounds of 68-70-71 for a 1-under 209 total. Andrew has finished in the top ten in every tournament this year, a record that few have matched over all the years of Stanford golf. Freshman Shane Lebow's 225 total was next from rounds of 75-73-77 -- Shane's final round was up and down with two double bogies and 6 bogies offset by an eagle and birdie. 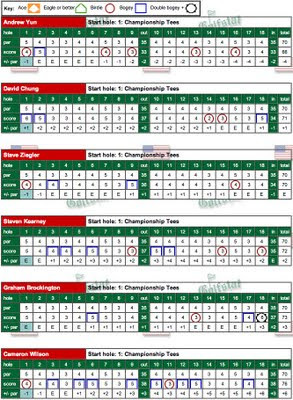 Masters participant David Chung is still rounding into form as he shot 226 on rounds of 79-73-74 to tie for 61st -- as indicated above his final round was steady with two bogies and one birdie through 15 holes but the triple bogie at 16 left him 4-over for the day. Sophomore Steven Kearney's 227 total left him tied for 64th after rounds of 78-72-77 -- only 1-over par through 14 holes in round 3, then double and quadruple bogies back-to-back on 15 and 16 led to his 7-over score. Senior Graham Brockington scored 232 total with rounds of 81-78-73 -- after leading qualifying going into the event Graham was likely disappointed in his finish despite a steady final round 3-over 73. Freshman Cameron Wilson carded a 235 total on rounds of 75-81-79 -- Cameron's final 9-over total in large part was due to a quadruple bogie 8 on the first hole and a double bogie 7 on the sixth hole. Next comes the Pac-10 championship held at our beautiful home Stanford Golf Course April 29-May 1st. Stanford finished 6th in the Morris Williams Invitational hosted by the University of Texas in a tourney marked by high winds and high scores. Finishing second individually, 1 shot behind, was sophomore Andrew Yun after rounds of 73-74-69 and a 216 total. Andrew has finished in the top ten of every event this year showing remarkable consistency. AUSTIN, Texas - Stanford's men's golf teams finds itself in fifth place at the 36 hole mark of the Morris Williams Invitational being held at the University of Texas Golf Course in Austin, Texas. The Cardinal shot a team score of 312 in its morning round on Monday, but improved by 13 strokes in the afternoon to card a 299. 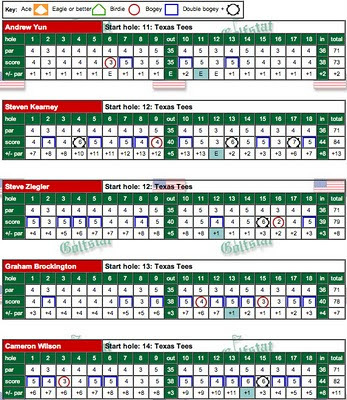 At 611, Stanford is +43 for 36 holes and trail first place and host Texas (296-304-600) by 11 strokes heading into tomorrow's final round. TCU is in second place at 601 (+33), followed closely by Arkansas (604) and Texas Tech (610). New Mexico (612) and Pepperdine (612) are on the heels of the Cardinal and the rest of the leaders. Stanford sophomore Andrew Yun is tied for third place at 147 (+5) after carding rounds of 73 and 74 on Monday. He had just one birdie on his card in the morning and offset six bogies with three birdies on his afternoon 18. Yun and Arkansas' Jamie Marshall trail first round leader Tom Hogue (141) of TCU by six strokes, while Texas' Julio Vegas (143) is two strokes off the pace. Senior Graham Brockington is tied for 23rd at 154 after rounds of 78 and 76. Senior Steve Ziegler is tied for 29th at 155 (+13) after rounds of 79 and 76. After shooting an 84 in his morning round, sophomore Steve Ziegler carded a 1-over 73 in his afternoon round and stands at 157, good for a tie for 40th place. Cameron Wilson shot rounds of 82 and 79 and is tied for 59th at 161.